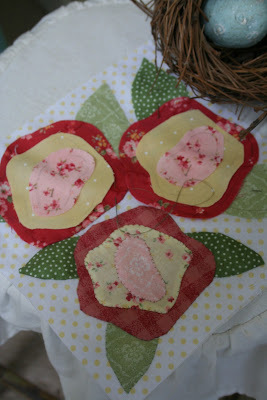 Today finds me working on some flower applique and really enjoying the process. There is something very soothing about handwork, if you don't rush it. 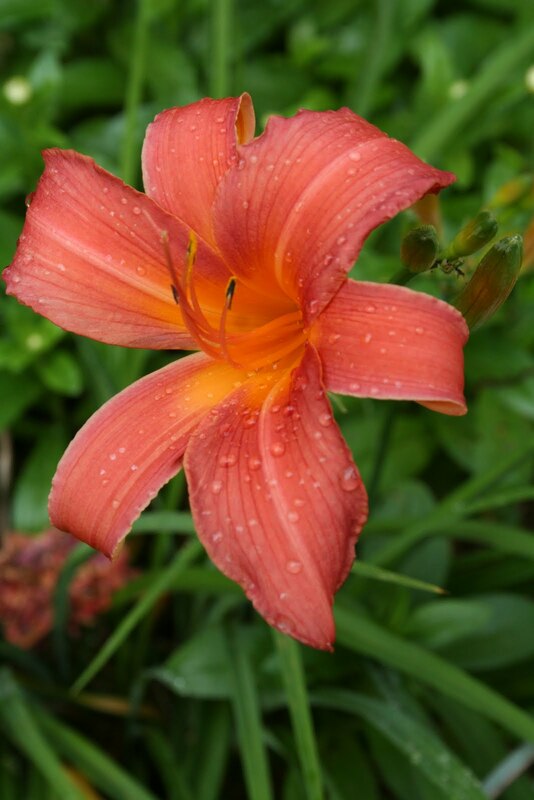 I stepped out into the garden this morning and this day lily was there to greet me. They have all just started blooming. A couple of years ago I visited a local day lily farm and brought home some beauties. I wish the farm was still there so that you could see the fields of lilies, but the owner closed recently. 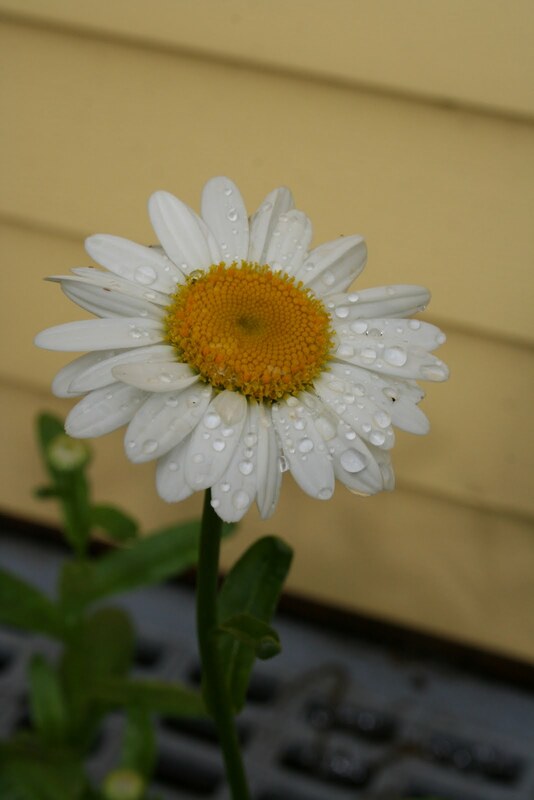 The daisies are in bloom. I planted many of these in the garden as they are my Mother's favorite flower. These big ones make quite a show and are such a happy looking flower. Peter Rabbit resides over all, just inside the garden gate. I watched "Miss Potter" again over the weekend. I can't help myself, I just love that movie! Your appliqued flowers are so pretty. I love handwork and always have a project with me so I can sneak in a few stiches. Is this for a quilt? It would make a pretty pillow too. Your daylilies are an unusual color. I had yellow ones when we had our house. I need to find some more. 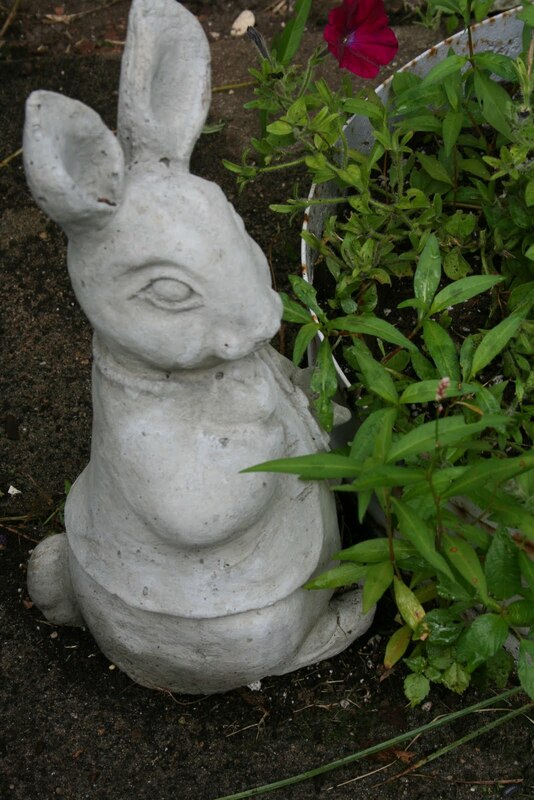 Your appliqued flowers are as lovely as those in your garden! You are right, the work is relaxing when you can take your time. Miss Potter? LOVE that movie, too! So lovely, thanks for sharing. I agree about the calming effects of handwork! And I LOVE Miss Potter! Haven't seen it in a while. Might have to rent it! I love your applique flowers, as well as your "real" flowers. I simply must learn to applique. Your fabric choices are very sweet. your appliqued flowers are lovely! Love your flowers sewn and grown. I have lots of lillies. They are one of my favorites.